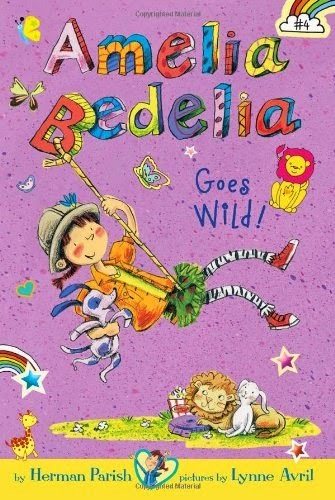 Literary Hoots: Amelia Bedelia Goes Wild! Amelia Bedelia is home sick—on the day her class takes a field trip to the zoo! She is sad to miss the trip, but has a dream that night that sparks a Big Idea: build her own zoo in the backyard! With the help of her classmates and their pets, Amelia gets hard to work planning and staging her very own zoo. She may even get some very special visitors. Does that author look familiar? Herman is the son of the Peggy Parish, the author of the original Amelia Bedelia, the lovable housekeeper that takes things very literally, resulting in hilarious mistakes. I grew up on Amelia (who didn't?) and was excited for this new Amelia character. Turns out: she's even better! Mr. Parish takes a dash of the literal-understanding old housekeeper and adds the adorable precociousness of a kid to create a hilarious, outgoing, lovable Amelia Bedelia. Any book in the series is worth reading, and this one is no exception. There's problems and mysteries to solve, friends to work with, and a zoo to build—all while balancing school. The illustrations alongside add even more humor. It's the perfect read for younger grade school kids. Even more fun to read—and laugh—aloud with them. Definitely recommended.